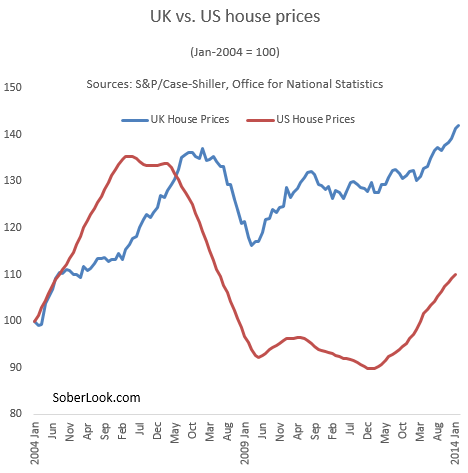 Sober Look: A UK housing bubble or something else? A UK housing bubble or something else? Home prices in the UK continue to rise to new highs, exceeding the pre-recession peak. The price increases started in London and have now spread nationally. Many families are quickly being priced out of the housing market. Some are calling it a bubble. The Guardian: - UK house prices continued to accelerate in February, rising by 1.9% during the month and pushing the annual rate of inflation to more than 9%, according to the latest data from the Office for National Statistics. Commentators warned of a "superbubble" and said the market was "out of control" as the official figures reported year-on-year prices rises of 17.7% in London and said first-time buyers had experienced double-digit price growth. Just to put this in perspective, US home prices are now roughly at the levels they were a decade ago. UK home prices have risen over 40% over the same period. Many are blaming the Bank of England's so-called FLS (the Funding for Lending Scheme - see overview) for flooding the market with cheap mortgages. Indeed the program has resulted in lower bank financing costs and lower mortgage rates. But is all this cheap credit creating a speculative housing bubble in the UK or is there another factor at play? If you speak with British realtors, they tend to have one major complaint in common. The UK is facing a housing shortage as the post-recession home construction activity remains subdued. Homes are being built at about half the rate needed to meet the pace of British households creation. But that is also partially the case in the US - so why such a divergence in house price trajectories between the two nations? The answer, according to Goldman, is that unlike the US and some other nations that went on a building spree during the bubble years, the UK was facing a housing shortage even before the financial crisis. The UK housing "bust" happened without the "boom". GS: - And, while the shortfall in house building has become more acute in the years since the financial crisis, the rate of house building was also inadequate before the crisis. Unlike countries such as the US, Ireland and Spain – where house building rose sharply in the years leading up to the crisis – the UK has experienced a post-crisis bust in housing supply, without having experienced a pre-crisis boom. But with housing prices rising faster than wages, doesn't it mean that this rally should be ending soon? Not necessarily. 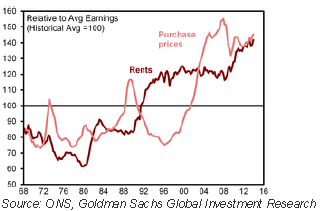 The acute housing shortage has put a similar upward pressure on rents as well, limiting housing options. And while fewer people can purchase a home after the recession, those who can end up paying materially less on their mortgage than they would be paying in rent (thanks to FLS). They are jumping into the housing market and driving up prices. Of course if the Bank of England pulls the plug on stimulus by raising rates or by imposing a more stringent lending requirement on banks, home price increases are likely to slow. The housing shortage however will still remain, resulting in higher demand for rentals. Whether paying more for home purchases or dealing with higher rents, one thing is clear: UK residents will be paying increasingly more for shelter in the years to come.